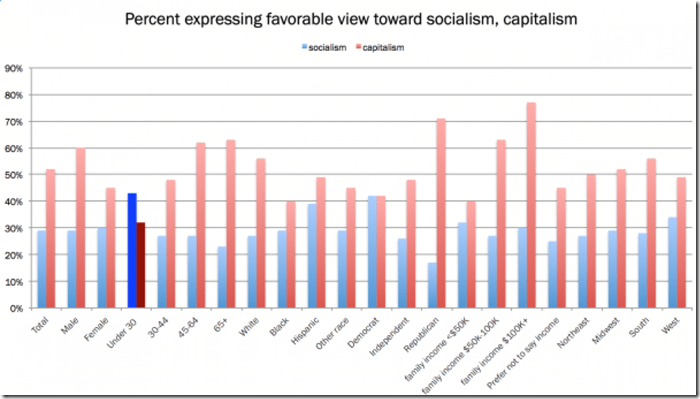 Just look @ the height of the blues lines on the above graph, for every category shown, to get a good idea of the percent favorability of socialism in America today. 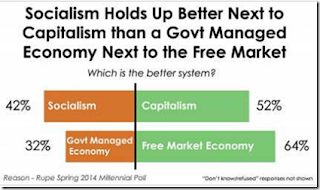 The highlights: 1) Young adults under 30 (millennials) favor socialism over capitalism 42% to 31%, & 2) Democrats break 42% in favor of socialism & 42% in favor of capitalism. 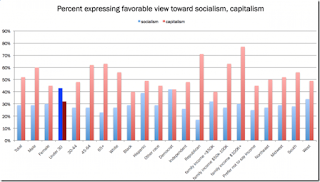 The above results from January 2016 reaffirm those of other studies & surveys that show millennials favoring socialism: In 2011 the Pew Research Center found 49% of people 18 to 29 viewed socialism favorably while 46% viewed capitalism favorably. An August 2014 Reason-Rupe survey found 53% of millennials had a favorable view of socialism & a June 2015 Gallup survey found that 69% of millennials would vote for a socialist for president so it is no surprise that Bernie Sanders received more millennial votes in the 2016 primaries than Trump & Hillary combined. All of the above statistics for people under 30 are in line with Professor Friedman's comment above. But to top it off click here to find out that millennials really have no idea what socialism is. It's not that the economic principles of socialism are taught in schools, like engineering principles were taught to me, but rather today's students are simply told that capitalism is a failure & all they have to do is look around to see this for themselves. Now if this is true who could blame the young graduates for their anxiety & dissatisfaction with capitalism & the world they are about to enter as adults. Now to be fair millennials shy away when they hear that in its purest form socialism is a political, social, & economic system where government owns the means of production. See graphic below – though 42% & 32% are still alarmingly high numbers to me. But let's not underestimate that deep down many millennials feel the socialist lure for free college, free healthcare, high minimum wage paying jobs, & the general understanding that there will always be a government program to depend on for every eventuality they come across in life with of course the unspoken (& really never thought of) law that they will always have the freedoms they currently enjoy that can be taken for granted. In short, millennials like the more up-to-date socialist definition regarding the services that government provides that are paid for by taxes – i.e., "other people's money" – Margaret Thatcher. 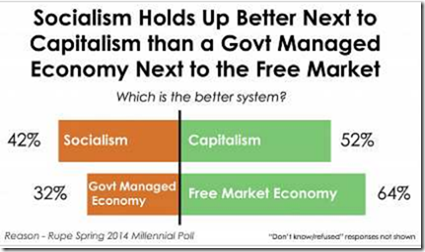 Of course it is not free market capitalism @ all that these young Americans see. It has been a mixed economy – part capitalism & part socialism - since FDR's socialist regime of the 1930s with a constant bias in socialism's direction with each government dependent law or regulation promulgated. Professor Friedman remarked in 1996 "America has been more than fifty percent socialist for many years & we are not getting our money's worth" & today's socialist favoring millennials won't either. I ask everyone (not just millennials) who is down on the American economy to reinvigorate themselves by clicking on & watching this video that shows how capitalism has contributed to a standard of living that brings the ordinary man the type of luxuries that only kings of the past realized in their day. 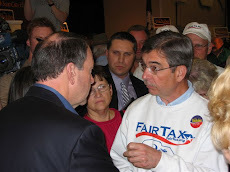 Professor Friedman explained the difference in lifestyles for people living in socialist countries & those living in capitalist countries when he wrote "whenever the free market has been permitted to operate, wherever anything approaching equality of opportunity has existed, the ordinary man has been able to obtain levels of living never dreamed of before. Nowhere is the gap between rich & poor wider, nowhere are the rich richer or the poor poorer, than in those societies that do not permit the free market to operate." Millennials who favor socialism will not have learned the lessons contained in this post until they start earning a living & realize what they had always thought of as other people's money is now suddenly theirs. lol - All they have to do is look at Argentina to know what a failure socialism is!!!!! We had a sister here from Ecuador but her family is in Argentina and she said it is bad. This post certainly proved Professor Friedman's statement in your opening paragraph. I sure wish that these students could just listen to the second video about capitalism and just think about what was said. Neal Boortz said many years ago that the government education system in the USA is a bigger threat to the nation than al Qaeda. Wish Neal still wasn't right these many years later. These students are so misinformed about the true meaning of capitalism that I worry that they would still blame capitalism as the problem even when their money becomes "other people's money." Doug- as always, thanks for great, very relevant analysis. Yes- we have a mixed economy which at present may be more socialist than capitalist - extra thanks to BO. However, too much of what remains capitalist is "crony" capitalism. Many large companies seek favors from government, support many lobbyists, in order to protect their market from potential new and more innovative start-ups. The impact on overall GDP growth of this is quite negative. Along with high tax rates, this is among top reasons for recent stagnant GDP growth since 2000.
Business leaders and few key politicians and economists must take to whatever media is available including social media to clearly explain what free market capitalism is, why it is the best system for rapid economic growth, how it improves lives for all not just the rich. 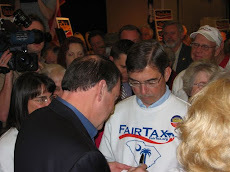 BTW - the significant power of lobbyists, supporting numerous dubious tax breaks for their crony capitalist clients, is a major reason why the most pro economic growth tax reform alternative, the Fair Tax, has faced strong Congressional resistance.